You must be a member of the Munich Ballroom Dancing Group to attend this activity. Would you like to join this group? 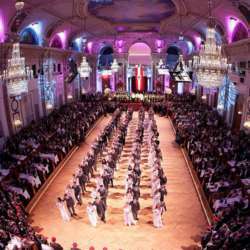 Once a year the young officers of the Austrian Armed Forces invite international delegations and the public to attend the famous and most colorful ball of the year in the former Imperial Palace - Hofburg. It is one peak of the ballroom dancing season. Join me dancing through the former place of living of Emperor Franz and Empress Sissi, having a good time - not only for the ball, but a weekend to discover Vienna. Have a great weekend in the wonderful capital of Austria. Invoices: None. I provide the data, and I am happy to help, but you book your own. Dresscode: Men are asked to wear uniform, or swallowtail (Frack) or tuxedo incl. a bowtie (compulsory). Ladies are asked to wear ball gown. Please keep in mind that the ball takes place on a Friday - you have to take at least 1/2 day off (vacation). The balance of male / female dancer is not part of my organization. However, dozens of attractive international officers may watch out for a woman to dance. You do not have to be a former officer to attend the ball - it is open to the public. This is not a commercial trip but a private offer to attend the ball with me. I cannot take over responsibility for any changes of the organizer or force majeure. If you have any questions, feel free to send me a private message only at Internations. I am looking forward to having a great ballroom dancing event.